Sri Lanka Tourism Promotions Bureau announced that a formal MOU is been developed with the University of Sri Jayewardenepura- Marketing Management Unit for marketing research insights to be done by final year students which will enable the tourism industry become more competitive in the global arena which is a first in the history of Sri Lanka tourism said its Chairman Rohantha Athukorala together with Vice Chancellor of University of Sri Jayewardenepura Prof. Sampath Amaratunge at the press conference where the International Inter- university Sri Lankan City Romp 2015 was launched at Hotel Taj Samudra. The logic of the MOU as explained was due to the rapid change that is happening in the global arena on the area of digital marketing where for instance 23.2 million people googled Sri Lanka tourism related searches in 2014 but we had only 1.5 million visitors whilst Trip Advisor reported that 54 million information searches were there in 2014 which tells us the conversion success rate for Sri Lanka. We must get smart in our communication strategy and model needs to be recommended by the best minds of Sri Lanka in a university like Sri Jayewardenepura so that we link the private sector to the think tanks of the country said Dr.Athukorala. Let's accept it we do not know everything in the world of Tourism, someone needs to help us he said which was the advice of the Hon. 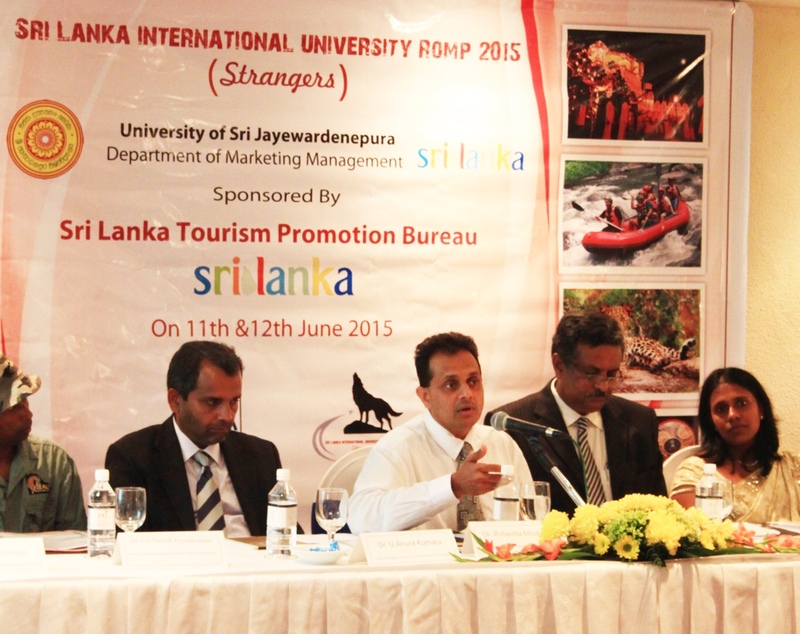 Minister for Tourism Naveen Dissanayake who had advocated the MOU. The Vice Chancellor Prof. Sampath Amaratunge said that he is glad this kind if mind set exists in the government and this is the best practice globally. In fact in the final year the best talent get picked by the private sector where we act as an incubator the world stage. We are looking for award to working with the Sri Lanka Tourism Promotions Bureau.